This illusion is designed to be viewed from the side. These photos show what you see when you look straight at the knitting. The pattern includes instructions for both versions. The illusion is based on a small part of the fresco, known as The Creation of Adam, on the ceiling of the Sistine Chapel in Rome, which was painted around 1512. The Creation of Adam has been referred to as ‘a masterpiece within a masterpiece’. The near-touching hands from the centre of the image are instantly recognisable and considered to be the most famous hands in the world. 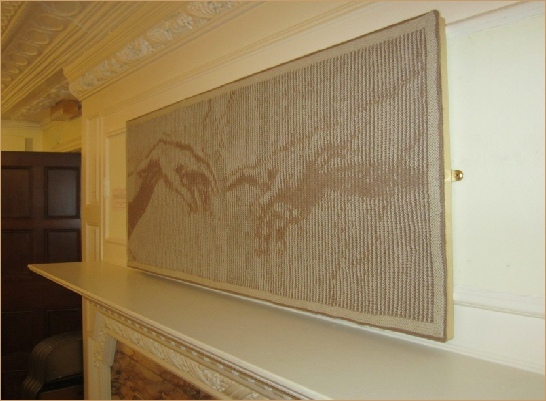 This photo was taken when The Creation of Adam was on display at Haworth Art Gallery, Accrington.